Once upon a time, a fella named K. Gordon Murray discovered that there was money in dubbing and distributing Mexican films for American audiences. He’s most known now for importing children’s movies like Little Red Riding Hood (La caperucita roja) and Santa Claus , particularly since Mystery Science Theater 3000 re-popularized it. Murray also brought over luchador movies, including several with El Santo (renamed Samson) and films like Wrestling Women Vs the Aztec Mummy. A genuinely cool thing about the movie is that never once does it suggest that women doing science or sports is at all unusual. 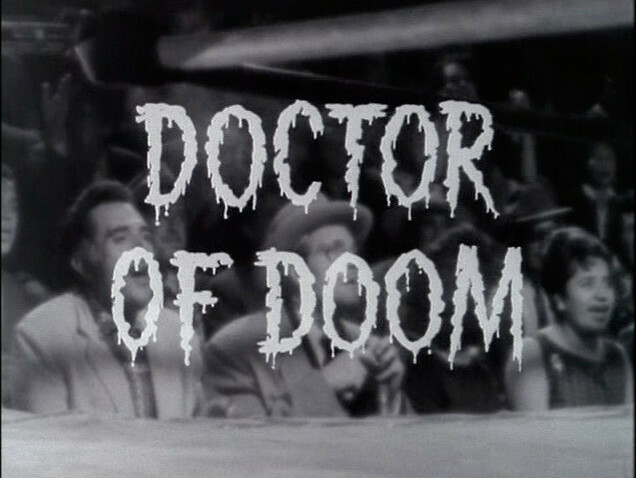 One of the “wrestling women” movies he imported for American International Pictures Television was Doctor of Doom , originally titled Las luchadoras contra el médico asesino . It’s a little weird that he didn’t go with “Wrestling Women vs the Killer Doctor”, but although less accurate the English title is nicely overwrought. This is how interrogation works, right? Every member of the cast crowds around the suspect? The “wrestling women” are Gloria Venus (Lorena Velázquez) and Golden Rubi (Elizabeth Campbell), who become roommates and fast friends during a cut after they meet at wrestling practice. Gloria’s sister was murdered only a few days ago by a mysterious mad doctor who the press have dubbed “The Mad Doctor”. She’s in remarkably good spirits despite her sister’s body turning up sans brain, but she is enthusiastic about getting vengeance. The road to her revenge is a strange one, filled with Ku Klux Surgeons, acid facials, gorilla brains, romance, and, of course, wrestling. The Mad Doctor wants to learn how to transplant a human brain into a healthy body. Pretty understandable motive for mad science, but for some reason he decided to start with something easier — putting a gorilla’s brain into a human body. Surprisingly, this works. Understandably, the gorilla is displeased. Absurdly, the brain is turning its new body into a gorilla. As if that’s too sane, the ape-man has a suit of armor that protects him from bullets but makes him look like a samurai bowling trophy. That would be enough to win my affection, but Doctor of Doom is not a movie that will stand on mere satisfaction. There’s just so much great stuff in it. Would-be assassins sneak in through the women’s bedroom window and get defenestration within moments. 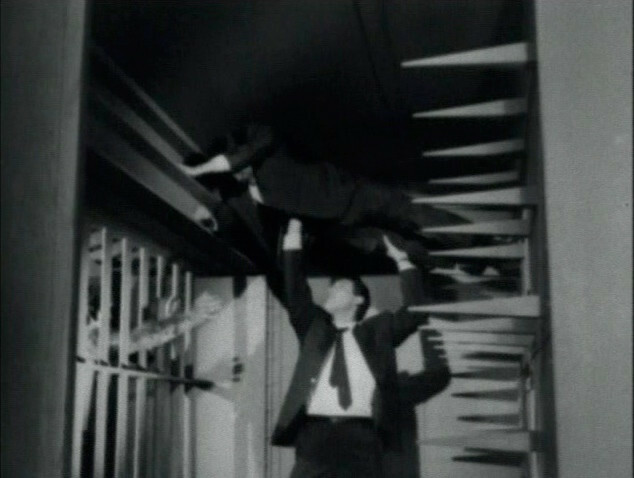 The Mad Doctor kills a snitch with a mouth-operated dart gun, right under the noses of the detectives. A lab abandoned for less than a few days is covered draped in massive cobwebs. Oh! And there’s an old-fashioned death trap that pushes its victims ever closer to the gorilla cage! A real friend lets you use him to stop a death trap. This movie is a treat. 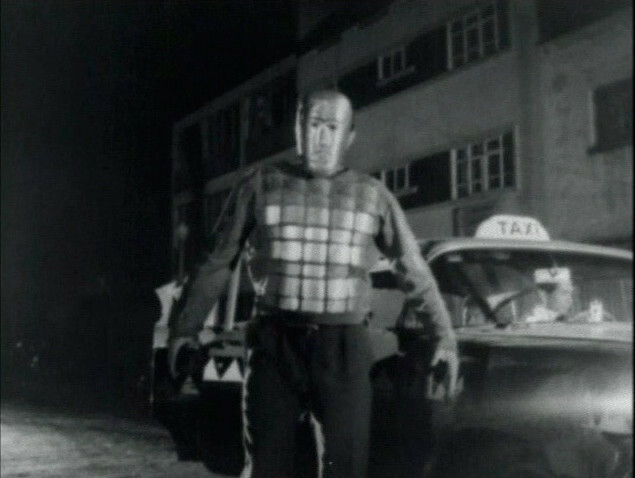 Nearly every scene has something to delight: odd dialog, bad science, weird costumes, silly action. It’s just relentlessly goofy and quite charming. 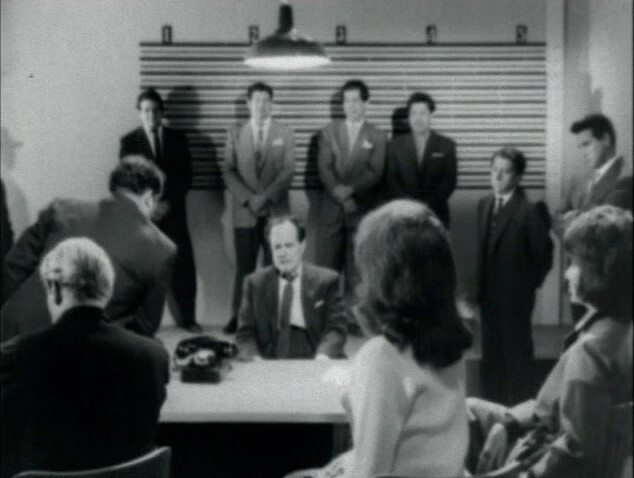 The copy I watched looked like a taped broadcast, so the picture was a little washed out and almost blurry like you sometimes see in old programs. That only bothered for the first few minutes. The film hit the ground running and captivated me for the duration. Doctor of Doom is a nice reward for sifting through hundreds of discarded movies. The joy of getting to see it for the first time will sustain me while I wade deeper into the sea of forgotten cinema. The Mad Doctor tells his monster to obey his hench goons.